Converts 6-Way Round connector to 4-Way Flat connector. Easily adapts tow vehicle connector to trailer connector. 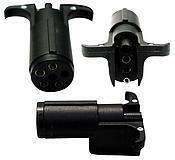 Full length plug shell ensures positive latching.